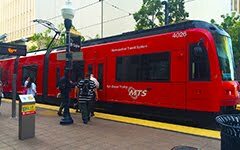 Media Availability: Lawsuit Challenges SANDAG’s Flawed Transportation Plan | transitsandiego: "WHY: SANDAG approved its $200 billion transportation plan on Oct. 28. The plan invests primarily in expanding and extending regional freeways, which will promote sprawl and reinforce the region’s dependence on expensive, car-oriented transportation. Plaintiffs cite growing concerns about climate change, an unaddressed need for livable, transit-oriented communities, and declining air quality in the region."